Here’s a new stocking option for Savage rifle owners. Sharp Shooter Supply’s new laminated “Dog Tracker” stock was specifically designed for long range benchrest and F-class shooting. It resembles a Tooley MBR, but features a special offset, low-profile fore-end. 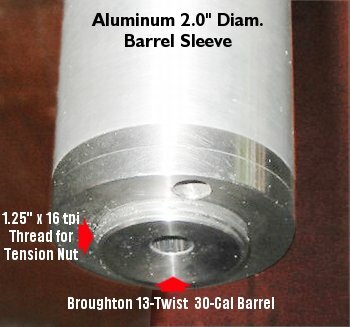 This design has a 3/4″ offset forearm to counteract the torque from fast twist barrels. 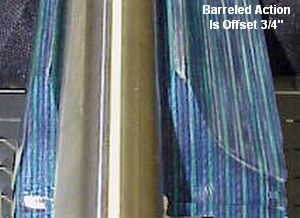 The fore-end is 3″ wide, and the underside has been “railroaded” for less drag and better tracking on the bag. (This means the center is hollowed out leaving a tracking “rail” on either side). 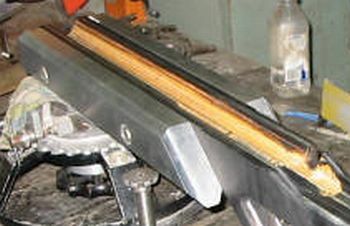 There is a 1/2″ flat on the toe of the buttstock to aid stability and tracking. A 1/2″ Pachmayr recoil pad is standard. The stock costs $299.00, fully inletted, with pillars installed. It is available in a wide choice of Rutland Laminate colors, finish sanded (400 grit), and ready to apply a finish. For more information on stock features and color options, visit the SharpShooter Supply Stocks Page. Share the post "New Offset Stock from Sharp Shooter Supply"
There was a lot of interest in Jeff Rogers’ Heavy Gun, featured in yesterday’s Daily Bulletin. Jeff is a race-car mechanic and engine builder in Australia, and you’ll find many innovative mechanical features on this rifle. Jeff reports: “The action is home-made. My shooting buddy Tony Z was the magician here–without his extensive machining experience, the action would still be on the drawing board. As you can see it is a Right Bolt, Left (loading) Port design. What makes it unique is the big gravity port, perhaps the only Drop Port ever made for a case of this size. 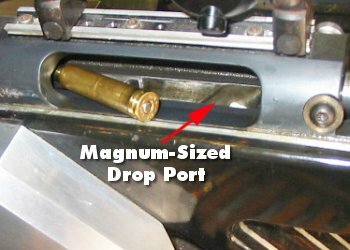 The port will work will cases up to 2.850″ in length, with a .550″ max rim diameter.” The action is constructed from Swedish 709m chrome-moly steel measuring 2.00″ diameter x 10″ in length. It has roller-assist extraction to help with the high pressure loads Jeff runs. The action is both conventionally bedded and glued into the stock. Share the post "Magnum Drop Port from Oz"